The constant news of how unaffordable the Australian housing market has become is a major cause of concern for first home buyers and parents. There are a number of ways that parents can help their children buy their first home. However, if the wrong method is used capital gains tax can be payable or the financial help can be wasted. One resource that in most cases cannot be used is superannuation. This is because super must be used to provide retirement benefits and cannot be accessed unless a condition of release has been met, such as reaching 65 or retiring from full-time employment. Also a super fund cannot lend money to, or purchase a house for, members or their children. Parents wanting to help children buy their first home, but who want to retain control, can buy a property in their name or that of a trust. The problem is at some point the property must be transferred into the son or daughter’s name. In this situation the child lives in the home and either becomes the owner upon the death of the parents or when title of the property is transferred to them. Using this method can protect the parent’s investment in the event of a divorce, but when the house is transferred capital gains can be payable. Once ownership of a property transfers, either upon death or transfer, a capital gains tax event occurs. This results in the parents or their estate paying tax on the increase in its value. Another method of providing financial assistance is for the parents to give money to assist with the purchase of the home. This could be an amount for the deposit, or it could be enough to fund the full purchase price of the property. 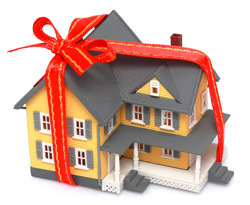 Using a gift can result in a transfer of wealth out of the family in the event of divorce. When parents make gifts to children the resulting asset, whether it is cash or property, becomes an asset counted by the Family Court in the event of a relationship breakdown. Parents can then see more than 50 per cent of the gift ending up in someone else’s hands. The best way for most parents to help children, and not face the risk of their financial assistance going to their son or daughter’s ex-partner, is to treat the amount provided as a loan. For this to be effective it is vitally important that the loan be properly drawn up. Neil Collins, a family law specialist with Westminster Lawyers, said, ‘‘Preferably the loan would be in writing with the document signed by all parties and setting out the terms of the loan, such as the interest payable and the mode of repayment. The loan may be repayable in full or in part on demand. Binding Financial Agreements, drawn pursuant to the Family Law Act, are also an excellent way to remove doubt as to the existence of the advance and how it is to be treated in the event of a separation’’. As a part of drawing up a loan agreement the parent should also consider having some form of charge over the property. This could be done as a mortgage, if it will not affect the chances of getting a loan, or as a caveat. No matter what choice of financial assistance will be used it is vitally important for parents to get professional advice before the funds are advanced.